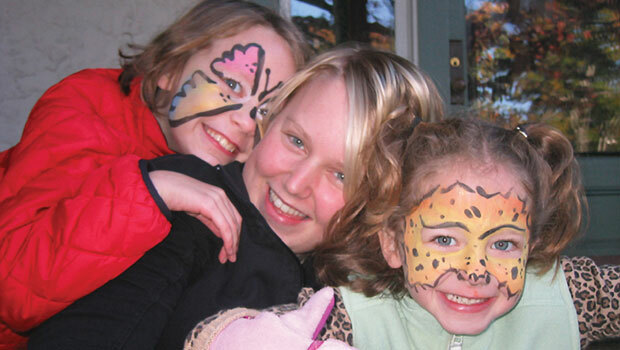 Hannah from Germany is an au pair in New Jersey, USA. Below are some suggestions for popular games to play with children indoors (or when you want the children to play quietly). All of these games can be played in English, as well as switched between your host family's native language and English, to practice pronunciation and vocabulary for you and your host children! Choose a long word. See who can write down the most words from the letters. To increase the challenge, you can set a time limit. Try seasonal words like "Valentines" or "Halloween." Draw a square grid made up of dots (start with 4 dots across). Players take turns drawing a vertical or horizontal line, trying to form a box. When a box is formed, the player who drew the line puts his or her initials in the box and takes another turn. The player who has the most boxes when all the dots are connected is declared the winner. The "hangman" chooses a word and writes a number of blank dashes on the paper, each representing a letter of the word. The other players guess one letter at a time, trying to figure out the word. If the letter is correct, the hangman fills in the corresponding space. If the letter is incorrect, the hangman begins to draw the figure (head first, body, arms, legs in series and so on). Decide before the game how completely the figure will be drawn (i.e. Do you add hands and feet?). Record an incorrect letter guess on the side so that they are not repeated. Phrases can also be used to increase the level of difficulty. Any player who guesses the word before the figure is drawn beats the hangman and is the next to pick a word. One player is chosen to “spy an object” in the room or the immediate environment. He or she begins the game by saying, “I spy with my little eye something beginning with the letter _.” The other players all call out their guesses, and the spy tells them yes or no. The player who guesses correctly is the next spy. Players choose a first name and write it on the paper. Within a given time, players must think of first names beginning with each of the letters of the chosen name. Choose four or five categories (e.g. colors, first names, cities, etc.). Choose a five-letter word. Create a grid by writing the word across the top of the page and the categories down the left side. Players must think of a word for each category that starts with each letter in the word and write it down in the corresponding box. To increase the challenge, set a time limit. Let kids teach you the rules. If they don’t know any games, get a book from the library and learn together! Some recommendations: Go Fish, Old Maid, Crazy Eights, Rummy, Spoons, and War. See if you can learn any games specific to your host country. Make up a list of items to be found. Set a time limit and see who finds the most items in the magazines. Blow up a balloon and shoot for a “basket," like a laundry basket or a box. You can also hang a string across the room (or put something on the ground), stand on opposite sides of the string, and try to hit the balloon across without letting it hit the ground. Write tongue twisters on slips of paper and place in a bowl. Take turns picking and see who can say the tongue twister five times fast. You can create your own or use some of these classics. To create your own tongue twisters, pick a topic and have the child write a list of nouns, verbs, adjectives, and proper names starting with the same letter. Make up a tongue twister using words from the list in a silly sentence.